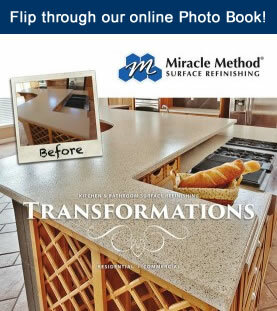 With over 35 years’ experience in the home building industry, Mike Simmons is running a Miracle Method Surface Refinishing franchise that tackles arguably the most important rooms of the home – kitchens and bathrooms. “I’m a second-generation builder. My dad was the old-type home builder where he taught me how to do everything. People would call my dad about building a house, and we would go and frame it, do the shingles, siding, trimmed it out,” said Simmons. Mr. Simmons was raised in Indiana, and moved to Georgia and started out remodeling homes, then moved into building houses including a number of them in Cobb, Georgia. Since 2012, together with his wife Kay, Mike has been the proud owner of a Miracle Method franchise in Northwest Atlanta. Regarding searching for a business opportunity, Simmons said, “We were looking for something different, something you could grow a company in a downturn market,” adding that a former employee had introduced him to the company during the economic downturn around 2008. Since the beginning, the Simmons’ Marietta-based franchise has done a number of jobs across the North Metro Atlanta area, spanning from Paulding to Gwinnett counties. Outside of residential work, much of their works has been has been for commercial properties, including hospitals, schools, universities and hotels. The Simmons’ franchise employs 11 people and up to 16 during the busiest times of the year, generating over 1 million in revenues in 2015. Mike and Kay were the recipients of the President’s Award for 2015, which is hand selected by Miracle Method President Chuck Pistor to recognize Exemplary Service and Commitment to the network. 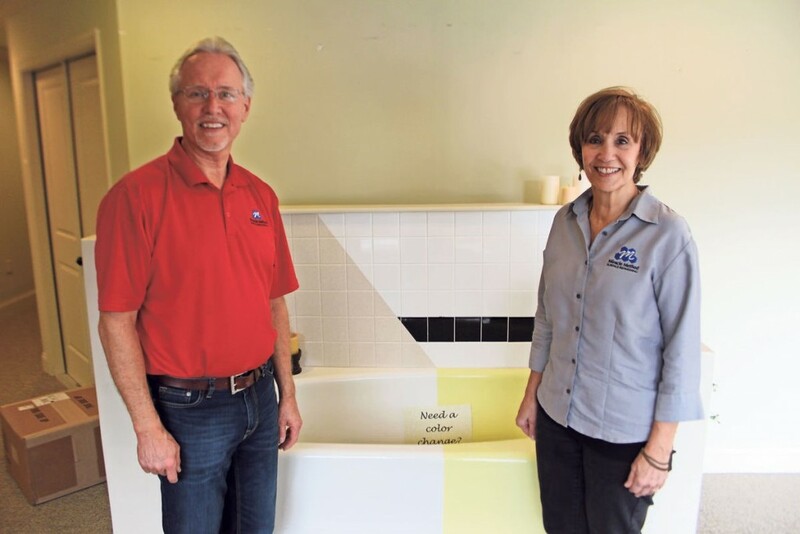 Miracle Method of Northwest Atlanta is preparing to begin one of their biggest projects in their 4 year history – refurbishing an estimated 340 bathrooms and floors at a university campus, mostly dorm bathrooms but also other areas including a tiled foyer. They will begin the work during the school’s Spring break while the students are off campus. Any work that is not completed during Spring break will be finished during the summer. Mike and Kay just celebrated 32 years of marriage. Working together presents its challenges, but they create a good balance with one another. Mike is a very driven entrepreneur and Kay is more focused on the numbers and she keeps them grounded. Miracle Method Surface Refinishing is looking to add 15-20 new franchise locations throughout the US and Canada in 2016 to keep up with our record growth. For more information visit: miraclemethodfranchise.com or call John Tubiolo, VP of Franchise Sales and Development at 855-212-7337. APPA Regional Conferences Exciting Again! We just got back from five successful Regional APPA Conferences—a great way for us to meet the very people responsible for the day-to-day maintenance of school facilities! As a proud APPA Strategic Partner, we’ve established strong relationships with hundreds of colleges and universities—from the most historic, like William & Mary, to some of the largest, like Ohio State. We’ve helped schools with everything from fixing leaky shower pans to refinishing tile floors, walls, and metal partitions. We’ve worked with the University of North Carolina, Western Michigan University, and more, accomplishing as much over one summer as the schools originally had planned over three years. Since saving time is essentially saving money, facility managers are increasingly turning to us as their premier provider of refinishing services. And, the APPA conferences are a significant part of that success. With more than 135 franchises across the US and Canada, Miracle Method can provide surface refinishing services to virtually any college campus. To learn more about Miracle Method, visit www.miraclemethod.com/collegehousing, or call 855-212-7337. APPA is the Association of Higher Education Facilities Officers—made up of facilities officers, directors, and managers responsible for overseeing and improving educational facilities and learning environments. Miracle Method is proud to be the nation’s leading provider of surface refinishing solutions for colleges, universities, and K-12 schools. We save facilities up to 75% over replacement costs. Our process eliminates the mess of tear-out and replacement. We permanently seal tile grout, making it mold- and mildew-resistant and easy to maintain. As we successfully wrap up the September APPA Regional Conferences, we’re gearing up for two more in October! We’d love to see you there. As an APPA Strategic Partner, Miracle Method attends APPA’s national conference as well as a number of its regional events. To find Miracle Method at an upcoming event, please see our schedule at www.miraclemethod.com/commercial. With 135 offices across the US and Canada, Miracle Method can provide its services to virtually any college campus. To learn more about Miracle Method and to read case studies, visit www.miraclemethod.com/collegehousing, or call 888-741-3511. 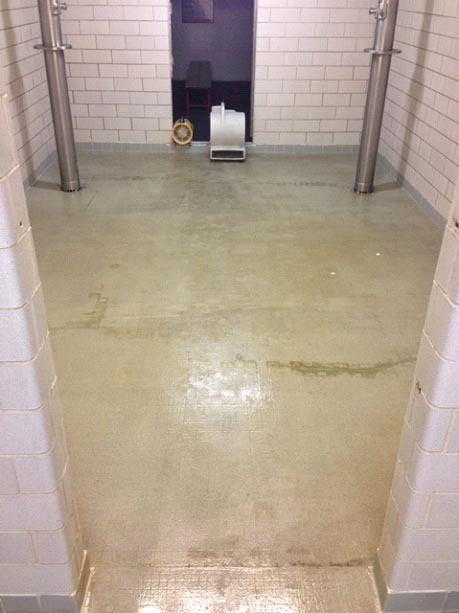 After 50 plus years of use, the tile in the football team showers at Minnesota State University Moorhead was worn and dingy and the concrete floor was badly discolored. The facility was unattractive to both the team and to visiting recruits. To fix the problem the university was faced with removing and replacing the tile and resurfacing the floor. Jeff Goebel, Moorhead’s Physical Plant Manager, estimated tile replacement alone would run in excess of $30,000. “…and this didn’t include any costs for unforeseen problems once demolition started. We all know that it can get pretty ugly once you start taking tile walls down,” according to Goebel. 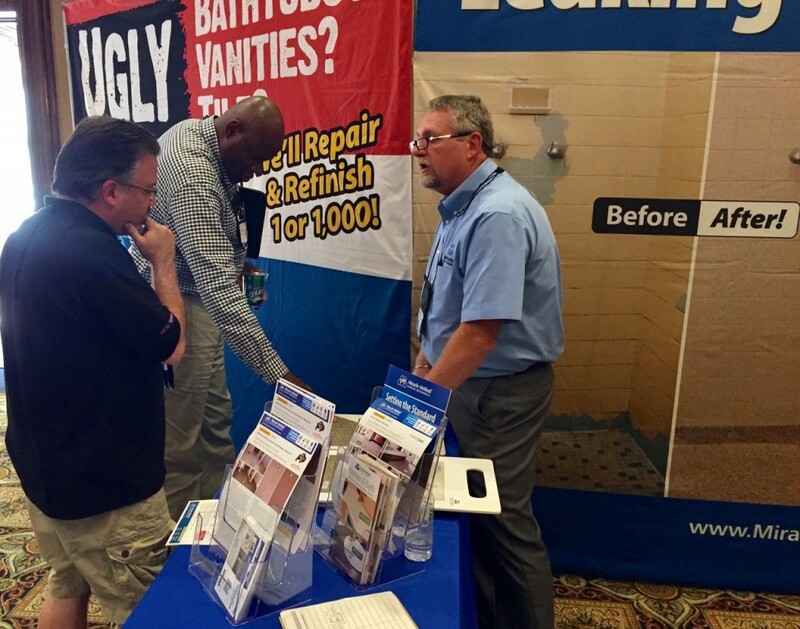 Luckily, Goebel visted the Miracle Method booth at a trade show, saw the company’s surface refinishing process and realized it could provide a viable and more affordable alternative to removal and replacement renovation. He was also pleased to learn that the end result would also permanently seal the surfaces making them resistant to mold and mildew. Miracle Method did the work over the school’s holiday break, completing the project in just seven days vs. an estimated three weeks for new tile and floor work. Refinishing saved the university nearly 75% of the replacement estimate. “By using Miracle Method we’ll be able to upgrade more showers and bathrooms in a shorter period of time. We’re very pleased with the results,” adds Goebel. Miracle Method provides innovative, affordable and durable solutions for colleges and universities in the US and Canada. Visit www.miraclemethod.com/commercial or call 800-444-8827 to learn more. Before: The concrete floor was badly stained and discolored. 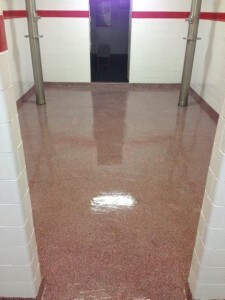 After: The floor is refinished in school colors and is permanently sealed. College dorms tend to take a real beating. After all, you have new students moving in every year. The bathrooms in particular suffer enormous wear and tear. 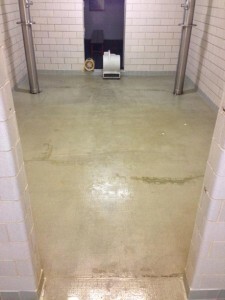 After a certain period of time, you’re going to want to improve the bathrooms in your dorms. An outdated and worn down bathroom isn’t going to help convince students to attend your school once they tour them. However, instead of remodeling your dorms’ bathrooms, you should use Miracle Method instead. Remodeling the bathrooms is an option, but it’s an expensive one, especially when you take into account the number of bathrooms that need to be updated in your dorms. Not to mention that a remodeling project on that scale is going to take quite a bit of time. 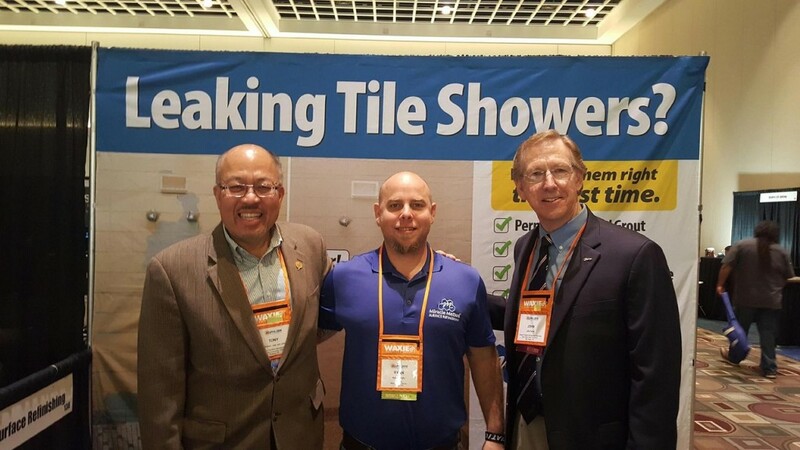 This is why you should simply consider tile repair and refinishing using Miracle Method instead. Refinishing your bathrooms won’t take long at all – you could get it done during a short student break. Not to mention that it will cost you just a fraction of the price of a remodel. You should also consider the fact that refinishing the bathrooms is more environmentally friendly since you’re continuing to get more use out of your bathroom fixtures, up to 15 more years in some cases, whereas with a remodeling project you’re sending your old fixtures to the landfill. Find out how you can refinish your dorms’ bathrooms during an upcoming break by contacting us today at Miracle Method.